In Quas Primas, his 1925 encyclical that introduced the Feast of Christ the King, Pope Pius XI reflected on the nature of the Kingdom proclaimed by Jesus Christ. His kingdom, the pontiff noted, “is spiritual and is concerned with spiritual things.” In proclaiming the kingdom of God, Jesus often had to strongly correct misunderstandings, especially from those who thought his rule would be based in political and military might, aimed at a violent overthrow of the Romans. When asked by Pilate, “Are you the king of the Jews?”, Jesus replied cryptically, indirectly: “You say so” (Lk. 23:3). He further explained, “My kingship is not of this world; if my kingship were of this world, my servants would fight…” (Jn. 18:36). “This kingdom is opposed to none other than to that of Satan and to the power of darkness,” Pius XI emphasized, “It demands of its subjects a spirit of detachment from riches and earthly things, and a spirit of gentleness. They must hunger and thirst after justice, and more than this, they must deny themselves and carry the cross.” It is the scandal and the paradox of the Cross that reveals the kingdom, just as making the sign of the cross reveals those who love and worship the king. The cross divides mankind because it demands a choice, a judgment about the person of Jesus Christ. But having chosen the cross, the division ends and we are brought into union with the King and his divine life; we receive communion, partaking of his body and blood broken for us on the cross. The cross thus unites mankind, and the inner nature of the kingdom is revealed. As St. Paul wrote to the Colossians, in the Son “all things hold together. He is the head of the body, the church.” The church is intimately related to the Kingdom: “While it slowly grows, the Church strains toward the completed Kingdom and, with all its strength, hopes and desires to be united in glory with its King” (Lumen Gentium, 5). 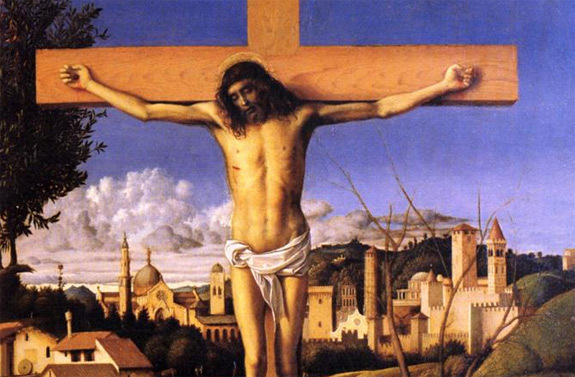 The true meaning of Christ’s kingship, states the Catechism, “is revealed only when he is raised high on the cross” (par. 440). Yet many will reject the King, enthroning themselves as rulers of their passing lives. Others, such as Polycarp, give themselves completely to the King who never does any injury, but instead delivers us from the power of darkness and transfers us into his eternal kingdom.